VATICAN CITY (CNS) — Pope Francis has accepted the resignation of Cardinal John Tong Hon as bishop of Hong Kong. Coadjutor Bishop Michael Yeung Ming-cheung, 70, succeeds the cardinal as head of the diocese, the Vatican announced Aug. 1. Cardinal Tong, 78, has led the Diocese of Hong Kong since 2009, when Cardinal Joseph Zen Ze-kiun retired as head of the diocese. Cardinal Tong has defended China-Vatican negotiations as a win-win situation while rebuffing worries that the Holy See would give up church principles and sacrifice the underground church in exchange for successful negotiations, reported ucanews.com. His outlook has been more optimistic than that of Cardinal Zen. When Bishop Yeung’s appointment as coadjutor was announced in November, he said he was grateful for having two predecessors who stand “like two big trees offering shelter” while storms rock Hong Kong society. Hong Kong has a charged political atmosphere due to the clash between pro-democracy activists and the local and Beijing governments, and the atmosphere has spread into Christian churches. Younger Christians are unhappy with their leaders adopting a reconciliatory attitude toward the Chinese communist regime, reported ucanews.com. 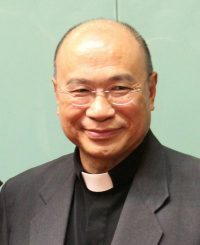 Yiu Sau-hing, English secretary of the Hong Kong Central Council of Catholic Laity, said Bishop Yeung has a rich administrative and pastoral experience from being the president of Caritas Hong Kong for many years. “He is not conservative nor radical but a moderate person. I believe he will be a bridge between China, Hong Kong and the Vatican,” Yiu told ucanews.com. Bishop Yeung was born in Shanghai Dec. 1, 1946, and worked for an import-export company before entering the seminary and being ordained to the priesthood in 1978. After a two-year assignment as a pastor, he was sent to Syracuse University in the United States to earn his master’s in social communications. He also completed studies in philosophy and education at Harvard University. He returned to Hong Kong as diocesan communications director. Cardinal Zen, 85, became the bishop of Hong Kong in 2002 and was named a cardinal in 2006.